I'm currently in beautiful Porto, participating as a faculty member at the Gary Chapman International School on Digital Transformation. Yesterday I led a discussion on open political innovation. Slides above, and a summary of the session by rapporteur Kamran Hooshmand is available on the ISDT wiki. The pitch: online open innovation platforms like Reykjavik's Better Reykjavik present interesting (and under-examined) opportunities for citizen engagement and the development of collaborative governance structures. Follow the Twitter hashtag #isdt11 this week for more updates from this innovative event. In the US, social media innovators are changing the way people work and play. In Iceland, these innovators may offer the best hope of rescuing an entire nation. Iceland emerged in the 1990s as a financial powerhouse after a thousand years on the sidelines of global history. Icelanders became one of the world’s wealthiest and happiest nations. In 2008, three of its banks collapsed, sending the national economy into a tailspin and shattering the people’s trust in government and industry. The government was quickly replaced by one promising transparency and reforms, while a protest party headed by a comedian took control of the Reykjavik city council. This new cast of politicians is not alone in their efforts to move Iceland out from under the economic cloud. Members of the country's tech and entrepreneurial sector, which saw explosive growth in the lead-up to the collapse, have emerged as leaders in grassroots efforts to set Iceland on a sustainable path. Last year a loosely-organized group calling themselves the Anthill convened a “national assembly” of 1,500 citizens. 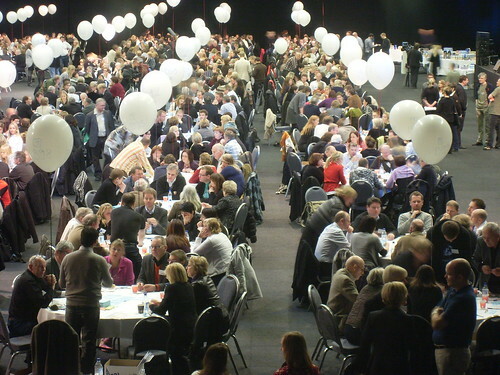 The day-long event, based on Agile methods and crowdsourcing theory, resulted in a coherent set of values, vision and ideas. Now the government is planning a similar meeting in preparation for rewriting the constitution. Inspired by open-source processes and leaning heavily on social media technologies, these citizens are rapidly prototyping new forms of democracy utilizing the web and open innovation. 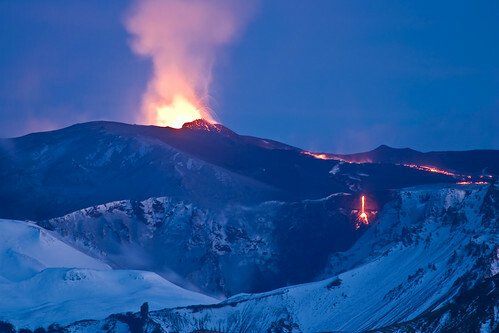 While the Eyjafjallajökull eruption seems to have subsided, the Icelandic people continue to reckon with the aftereffects of their country's financial collapse. Although currently overshadowed by the woes of the Eurozone, the economic situation for Icelanders remains grim. While the economic crisis or kreppa is ongoing, there have been several encouraging narratives that have caught my attention and interest. The kreppa is generally understood to be a problem of opaque, corrupt politics as much as it is one of economics. The Icelandic media is eager to identify green shoots of progress, particularly those in the form of grassroots organizing, small businesses, and tech and media entrepreneurship. 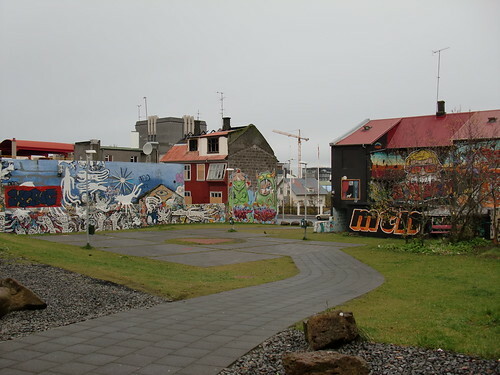 Many Icelanders hope that they can innovate their way out of this crisis. My interest focuses on this unusual confluence of populist demand for political reform with a surprising array of commercial and noncommercial initiatives to promote economic and political innovation. One of the leitmotifs of kreppa blogosphere chatter is that Iceland has nowhere to go but up, thus there is nothing to be lost in sociopolitical experimentation. With a highly literate national population of just a few hundred thousand and excellent communications infrastructure, radical ideas and plans seem to move quickly from planning to implementation. The Icelandic Modern Media Initiative, for example, aims to legally establish Iceland as a jurisdiction that radically supports investigative journalism and free expression, and has attracted significant support. Other "experiments" seem to have lost steam as participants can quickly realign their attention and priorities. One influential institution in the area of entrepreneurial experimentation and political "crowdsourcing" has been the Ministry of Ideas (Hugmyndaráðuneytið). While I plan to write more about the Ministry and its innovation and crowdsourcing efforts in the future, I currently have a small bibliography of media reports in languages I can read. Maybe this will be useful to others. Angela and I moved to Austin last August. I took an awesome postdoc position with Sharon Strover and the UT Austin | Portugal CoLab in advanced digital media. What's the CoLab? 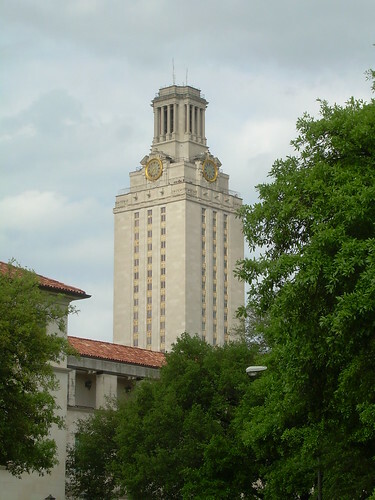 "The UT Austin | Portugal International Collaboraboratory for Emerging Technologies or CoLab is a partnership between the Science and Technology Foundation of Portugal (FCT) and the University of Texas at Austin, in conjunction with several Portuguese universities. Launched in 2007, the goal of this project is to expand the presence of advanced digital media through educational and research exchange." I'm currently teaching a semester-long comm theory course for the doctoral digital media program at the University of Porto. I was in Porto in March to start things off face-to-face, and we've since held weekly seminar meetings via videoconference. I'll return to Porto next month for final exams. I also have a lecturer appointment in the Radio-Television-Film department at UT, and taught an undergrad Intro to Digital Media class both last fall and this spring. The classes were incredibly fun and rewarding to teach, and provided an opportunity to stretch my media production knowledge a bit. Both classes worked with Carlos Santana's Architects of a New Dawn project to produce short web videos (read about it in Communique). My research has included the continuation of inquiries started at Buffalo as well as some progress in new directions. I got to travel a bit for conferences and have been happy to have several manuscripts published or accepted for publication in the past few months. While I won't be in Singapore next month for ICA, papers coauthored with Kevin Lim and Michael Stefanone will be presented by those fine fellows. My "new directions" include work related to indie media institutions and economics. I collected survey data from several hundred attendees and all of the exhibitors at the STAPLE! Independent Media Festival in March, and will be presenting some of this work at NCA this fall in San Francisco. The changing relationships among artists, consumers and content are a fascinating topic, and I'm especially interested in the new economic spaces and models that indie creators are currently experimenting with. This fall, I'll be joining the faculty of the School of Communications at Elon University as an Assistant Professor. Elon, located between Greensboro and Chapel Hill / Durham, is a dynamic institution and a great professional and personal match for my interests and skills. The rapidly growing comm school just launched a cutting-edge Masters of Interactive Media program. Like the school and university as an whole, the iMedia program has a special focus on social engagement. Projects within the school include the Elon/Pew Internet Project Imagining the Internet and the Sunshine Center of the North Carolina Open Government Coalition. Many other little things -- meaningful sustainability initiatives, the strong promotion of study abroad (and a winter term that makes it logistically easy), the stunningly beautiful campus, etc. -- give me much to look forward to. How many hours per week do you chat with a romantic partner on the phone? How many text messages do you exchange with a romantic partner per week? Since I wrote this blurb a while back, that page has become one of the most-hit on this site. My referrer logs indicate that Google is sending people here due to their passionate interest in a search plugin for Scholar. The quick and easy solution to searching Google Scholar from Firefox is to install the search engine plugin from the Mycroft Project site. That's it. Just click the link, hit the "add" button on the popup, and google scholarly to your heart's content. There's another Scholar search scenario that requires a tiny bit more effort. If you are affiliated with a research institution or library, you may have noticed that Scholar will automatically return links to content in your library (full-text journal articles, bibliographic records, etc.) if you using one of their computers. If you would like to get this functionality from somewhere else (such as Starbucks or your home), you need to route your Scholar search requests through an HTTP proxy at your institution. Example: my institution is the University at Buffalo, and my library provides off-campus access through a proxy at https://gate.lib.buffalo.edu/. If your institution provides access to a proxy, it's easy to build a Firefox search plugin that utilizes it for all your Scholar searches. Just go to the Plugin Generation page and fill out the relevant details. For my UB Scholar plugin, I just tweaked the default Scholar plugin URL from http://scholar.google.com to http://scholar.google.com.gate.lib.buffalo.edu, and changed the name from googlescholar to googlescholar_ub. The XML of my plugin is available here for reference. Good luck and happy plugin-making. Feel free to drop me a comment if you have any questions. I dropped by the Mass. Ave Project again this weekend to lend a hand with the strawbale greenhouse being constructed there. The plan was to compress and plaster the bale walls. 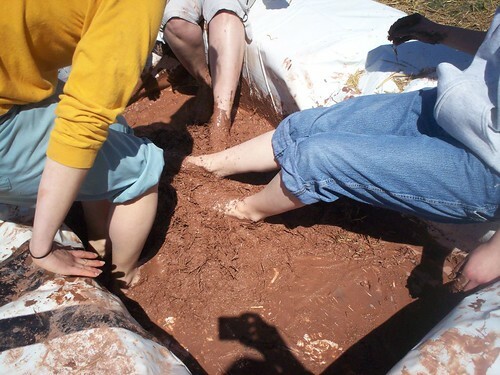 While we didn't quite get that finished, community members and friends had a lot of fun mixing the plaster with their feet. The Buffalo News stopped by, and caught me crouched on top of the framing as we worked to "cap" the bales with a wooden support structure.